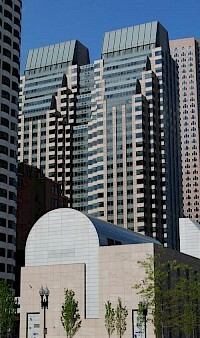 125 High Street is a 30 floor Modern highrise in the Financial District of Boston, Massachusetts. 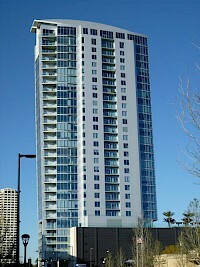 Standing 452 feet (138 m) tall, the highrise is currently the 22nd-tallest building in the city. 125 High Street has approximately 1.8 million square feet (167,000 square meters) of Class A office space. It was designed by Jung Brannen Associates. The complex consists of four buildings. The 1300 Lafayette East Cooperative is a large, 336 unit luxury housing cooperative in the Lafayette Park neighborhood of the near-east side of Detroit, Michigan. The building is notable for its address "1300" displayed in giant numerals on the North and South sides of the roof which are visible for miles in Detroit and Windsor. Constructed in 1961 and completed in 1964, 1300 Lafayette East stands at 30 floors. 595 Market Street is a skyscraper in San Francisco, California. 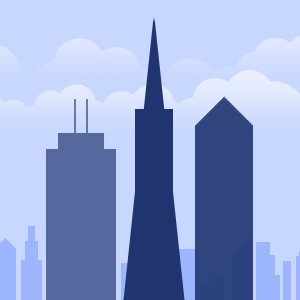 The building rises 410 feet (125 meters) in the northern region of San Francisco’s Financial District. It contains 30 floors, and was completed in 1979. 595 Market Street currently stands as the 37th-tallest building in the city. The architect who designed the building was Skidmore, Owings & Merrill. It is one of the few hexagonal-shaped skyscrapers in the city. 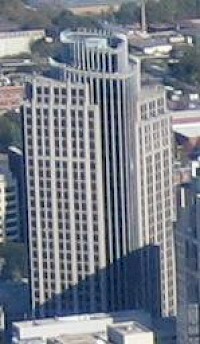 The Blaustein Building is a highrise building located in Baltimore, Maryland, United States. The building stands at 360 feet/110 meters, containing 30 floors. The building was constructed in 1962, and was developed by Vincent Kling & Associates. The Hub Department Store was destroyed in order for this building to be built. 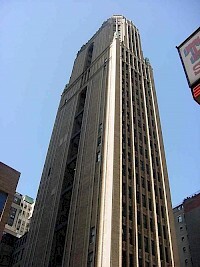 .The Blaustein Building was constructed for the Blaustein, to move into a larger headquarters.